Auckland artist Selene Simcox is in residence at Manthel van Reijn Studio (Mt Eden) from 21 February to 11 March and continues to explore the relationship between paint and vinyl and the role that performance plays in her work. “There are workman-like approaches in this work, rules and boundaries evolve like a fairytale or narrative around the development of each artwork. These rules and boundaries are given form by measurement, time and props that provide the framework for creativity to move through”. 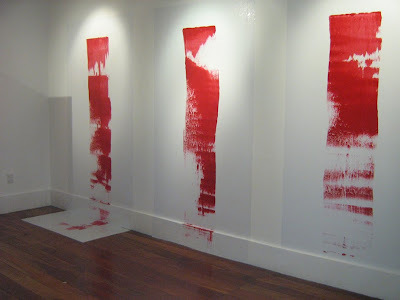 The vinyl surface allows for the fluid movement of painting-in-performance to act upon it. The paint is moved with a squeegee, tracing the artist’s performance, stripping painting back to the barest moment, leaving a mark that becomes the only evidence that the artist has been there. Selene Simcox graduated from Whitecliffe College of Arts and Design in 2009 and has exhibited at The Bluecoat (Liverpool, England), Massey School of Fine Arts (Wellington) and recently at Corban Estate (Auckland). This is her first solo show. Selene Simcox at Manthel van Reijn Studio, Banklink House, 12 Normanby Road, Mt Eden, Auckland, 21 Feb-11 Mar 2011. Entrance through Normanby Road Foyer or the Edwin St Carpark. Selene Simcox was recently interviewed by Amy MacKinnon from The Aucklander,and by Karley Feaver.